Path of an Outcast: MSU Elves in KoW - possible? 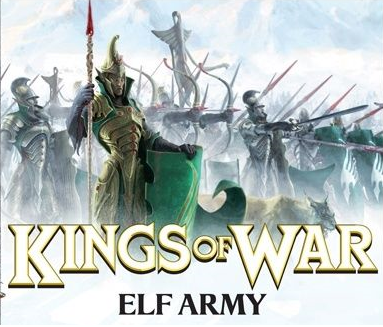 MSU Elves in KoW - possible? I continue with some KoW rumblings as I try to prepare for my first game in the new system. I would love to transfer the style I used so far in WHFB, i.e. Multiple Small Units = MSU. I am aware that it may not be easy or even remotely similar to what I have experienced so far but it is as good point to begin as usual. We will see soon enough (I hope) if my assumptions were correct or where they need to be re-evaluated. KoW has, as I am sure I have mentioned already, their unique way of army list building. It evolves around regiments and hordes as the core of the force. You can take as many as you want for agreed point allowance. The trick lies in the fact that other elements you want to take for the army, troops, characters, monsters, war machines, have to be unlocked with regiments or hordes. This creates a very interesting situation where you really have to get some regiments/hordes in and no matter what you do the army does look like an army. It actually have plenty of units. Now the challenge lies in choosing the right balance for your own preference and style. I am not yet sure what the styles are going to be like in KoW but at least that is the assumption. The first question then is regiments or hordes or maybe a mix of these? Regiments have smaller foot print, are cheaper than the horde but obviously have fewer attacks and lower nerve value. Single regiment unlocks two troops and one character or a war machine or a monster. If you buy horde it costs you more than a regiment but gives you better attacks and nerve value and unlocks four troops and a character and a war machine and a monster. However, there is a very important difference. The abilities do not scale linearly. What I mean by that is that 2 regiments will cost more than a single horde despite visually consisting of the same number of models. The number of attacks may not be twice as high and the nerve value is not doubled. Horde still allows you to buy one more element than 2 regiments. This makes the choice much different and more difficult for a beginner I think but nonetheless still exciting. Do I want more stable horde but risk being charged by more units at the same time? Do I take regiments for extra deployment drop that potentially may be still negated by extra element horde unlocks? Or do I take a mix of both and use these as a team anyway? Personally, I prefer smaller units, due to the style I prefer and which I hope to transfer in some form to KoW. MSU in KoW - is that even possible? 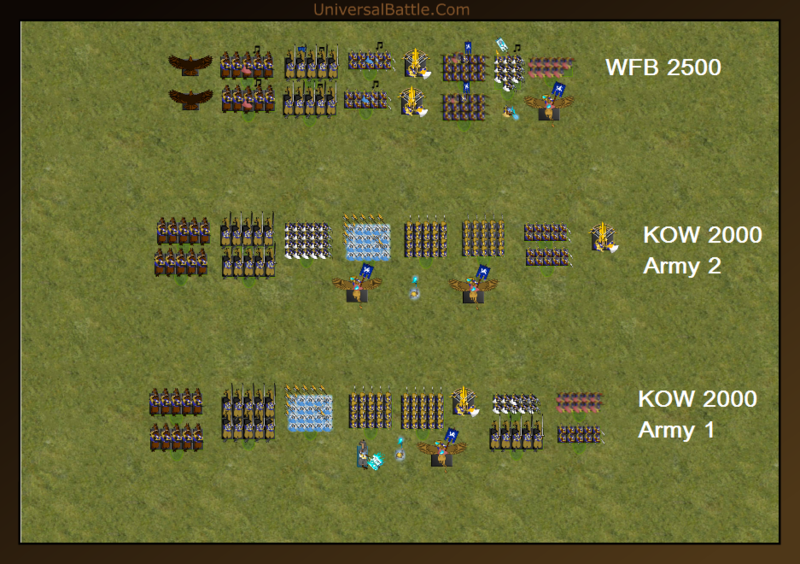 In WHFB I relied on larger number of units to create advantageous deployment. More units allowed for more mobility and swarming tactics where I could defeat potentially stronger enemy if the attack was executed with many units at the same time. Is this or similar approach still possible to be developed in KoW? I definitely hope so but there are things I have to consider to take into account. I mentioned before that in KoW due to their unique composition system armies look like armies. At 2000 points there are often 10+ elements in the opposing army anyway. In addition to the difficulty of out deploying the opponent their formation will not leave any obvious gaps and moving around or isolating units might not be that easy (more on it later). This means that I need to re-define the deployment phase to be able to still use it to my advantage. I have some initial ideas but I will need to play some games first to see how they should work in details. Movement is very important in KoW. But it also works in a way that is not easy to master as you either maneuver or move fast. With tough battle lines there might be no gap to exploit, especially that the units do not change formation in this game. However, there might be some options worthy exploring that affect movement and allow for greater mobility. Flying units/characters can be very useful in jumping over the enemy lines and be ready to strike their flanks or rear. I don't intend to field Drake Riders yet (no models and I seem to "hate" dragons due to abundance of these in late 8th edition as well as betrayal in background stories, i.e. End Times - Khaine :-P). But Griffon Riders as Drake Lords can be a good option here. Another option is to use Nimble units, this special rule allows the unit to make an extra pivot in addition to what is normally allowed. Vanguard and Pathfinder are other special rules that aid you in the deployment and movement phases. Vanguard is the extra advance before the game starts while Pathfinder ignores certain terrain effects. I mentioned earlier that shooting can destroy enemy units but it can also make them waver or add some damage points. I think it is a perfect solution for me as I would be able to inflict some damage at a distance thus making it easier for my combat troops to actually rout their enemies. It will probably take some practice to learn how to implement it properly but I am looking forward to using shooting for such purpose more than to inflict damage. Now that is the most important part as all the movement will actually lead towards this moment. Attacking from the flank or from many directions at the same time should do the trick as always. After all, doubling or tripling the attacks greatly encourages you to do it. If well executed it might mean the enemy is eliminated with no damage on the part of my own units. However, I noticed that with more units on the enemy side and the game mechanics of KoW system that one should expect some kind of retaliation anyway. You don't overrun that far to avoid the enemy after destroying units. So you might still be visible for the remaining foes. Or when you reform after the victorious melee. I believe that I will need to learn to estimate where the units can be in a few turns ahead, as it used to be in WHFB, but it will take a few games to get the feeling of it simply because the regiments move differently. And while I observed that breaking enemy battle line formation can be advantageous as expected it is often far from over. I witnessed some games where the end result was still a draw despite one army being initially overwhelmed by the enemy. I attribute it mainly to the fact that units do accumulate the damage over the battle. Both armies have 14 elements which might not be that great but for Elite army is not too bad either (I think). I took Hunters regiment for that Vanguard and Pathfinder and while they are not Elite they have 25 attacks. I decided to take infantry regiments as they are slower and might take more damage on the way. At the same time I upgraded BSB to Drakon Lord for another inspire source but also to have an additional flier. He is not crazy with his 5 attacks but if on a flank or rear it might be quite a problem if the attack is coordinated with other troops. Last but not least, here is the picture to visualize how the armies look like, with my MSU force from 8th edition for comparison. Please, take into account that the armies in KoW are only 2000 points. A very interesting read indeed SM. I'm very much looking forward to seeing what your mad skillz can bring to the table in KOW and I've no doubt you'll be teaching me things along the way. I'm going to give the Empire of Dust a run this weekend against my brother to get a grasp of the rules and very much looking forward to it. Interestingly enough you missed out on one element and that is magic. Although certainly not as higher impact in KOW (certainly not a bad thing) as WFB it does however still be worthy of a mention. I'm not sure how much access you have to it however wind blast I see could be a good tool for you because you like movement so much and pushing enemy units away allowing you more shots on target or delaying them for further advantage to set up charges. Good to see the armies from a glance look very similar but how do you feel about going to some 'big' blocks? Are you a little disappointed you can't take your infamous MSU army and totally transfer it? Either way, looking forward to a new chapter in the journey - for both of us! I am curious myself where this new journey is going to take us. It is completely new so whatever I think might work has to be verified. Hopefully we both will learn the ropes fast! The fact I didn't speak about magic is an evidence to how much I need to learn :) I did look at the spells and you are correct, I like movement a lot so Wind Blast might be a good candidate here. I will think about it of course and see how to implement that to test its utility. The tricky part, at least for me at this stage is, that you can cast just a single spell at a time. Elven wizards come equipped with Heal as a default spell and I added Bane Chant that will add Crushing Strength or Piercing to the friendly unit. Both sound great but as I have a single wizard I wonder if that wouldn't be too much to give him third spell as it would make some decisions even harder. It is definitely one of the things to consider anyway. I think that it also shows that you can have many things but cannot have everything in the same army so you really need to find your way. I am not disappointed at all! Just need to learn how to play in that game. Visually they look great already. It is just a matter of getting used to the fact the opposing forces are going to have quite a few units too. I think regiments will be as maneuverable as troops so I should be fine with it. And Sea Guard will look way better in 4 ranks too! Looking forward to hearing about your own experiences too! have you any plans to talk about what functions each of the units will take in the army, strategies and such?